Oakwood–Vaughan is a multicultural neighbourhood in the York district of Toronto, Ontario, Canada. The central strip of Oakwood–Vaughan, along Oakwood Avenue, is more recently known as Oakwood Village, the name of the neighbourhood's Business Improvement Area (BIA), annual arts festival, and public library built in 1997. The neighbourhood, commonly known as OV, is bordered by Eglinton Avenue West to the north (Briar Hill–Belgravia), Dufferin Street to the west (Caledonia–Fairbank), St. Clair Avenue West to the south (Corso Italia and Bracondale Hill), and Winona Drive to the east (Humewood–Cedarvale). Oakwood–Vaughan was part of the former City of York before the amalgamation of Toronto in 1998. The neighbourhood's northern half is nicknamed Five Points for the intersection of Oakwood Avenue, Vaughan Road, and Belvidere Avenue. The western half was called Northcliffe and is more recently known as Northcliffe Village. View of Oakwood–Vaughan from Oakwood Avenue, north of St. Clair Avenue in 1924. The area was initially developed as a streetcar suburb. Oakwood developed as a streetcar suburb of Toronto. Stephen Rogers constructed one of the first houses (on a 5 acres plot) in this neighbourhood at what is now Rogers Road and Oakwood Avenue. The main streets of Oakwood–Vaughan are Oakwood Avenue, Vaughan Road, Rogers Road (named after Stephen Rogers), Dufferin Street, and Eglinton Avenue West; these main streets generally demarcate borders with other York neighbourhoods and neighbourhoods located in the current district of Toronto. A portion of Little Jamaica is located on the northern border of the neighbourhood, situated along the south side of Eglinton Avenue West between Oakwood Avenue and Marlee Avenue. North of Vaughan Road and east of Oakwood Avenue, this part of the neighbourhood has a set of one-way streets that acts as a maze for motorists. Oakwood–Vaughan has changed political boundaries on several occasions. One of the most significant changes was the result of amalgamation in 1998. 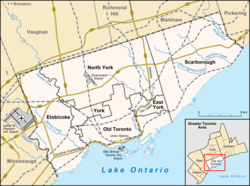 Formerly part of the City of York, York became part of the City of Toronto, along with Etobicoke, Scarborough, and North York—all cities in their own right before January 1, 1998. Municipally, the area has a complex history and its boundaries have changed several times. Since the 1998 amalgamation, from Dufferin Street to Winona Drive and north of Rogers Road up to Eglinton Avenue (and beyond), it is a small part of Ward 15: Eglinton—Lawrence. The eastern part of the neighbourhood (east of Oakwood Avenue) also extend into Ward 21: St. Paul's. Residents west of Oakwood Avenue and south of Rogers Road reside in Ward 17: Davenport. A visual representation of the wards is provided for reference. Provincially, the political boundaries have also changed, as recently as in the 2007 provincial election where it was designated part of the St. Paul's riding. Until 2009, MPP Michael Bryant represented the residents. Bryant stepped down in early 2009, and Eric Hoskins won a by-election, becoming the new MPP. Residents living east of Oakwood Ave. are part of the St. Paul's provincial riding. The official website, however, has an outdated map from 2005, and so lists the area, incorrectly, as part of the Davenport riding. Federally, the area is also part of St. Paul's riding and is represented by MP Dr. Carolyn Bennett. There are several organizations in the Oakwood–Vaughan area that are working to effect positive change and are trying to counteract the negative, often stereotypical, media coverage of the area. The Oakwood Village BIA, founded in 2009, is actively trying to beautify the area and attract vibrant businesses. Another organization is the Oakwood Village Community Association, (formerly 5 Points Community Action), that was founded in 2005 and has grown tremendously as young families continue to move into this safe, conveniently located, and affordable neighbourhood. 5 Points Community Action originally took its name from the "5 Point" intersection of Oakwood Ave., Vaughan Rd., and Belvidere Ave. While there are several outstanding issues to be tackled, the group has coordinated and completed several community projects to strengthen connections between neighbours, politicians, police, and community agencies. A community garden, located at the corner of Belvidere and Oakwood Avenues, was completed with funding from Clean & Beautiful City. A plaque located on the site testifies to the commitment and determination of residents to reclaim and beautify their shared space. Another project, a striking mosaic, is located on the south side of Belvidere Ave., on the community garden's retaining wall. This was completed in partnership with Art Starts. The mosaic illustrates the motif of 'roots' and has “welcome” in many different languages, including Polish, Hebrew, Italian and Portuguese, among others. The Oakwood Village Transit Island features a 4.88 metres (16.0 ft) metal palm tree erected in October 2010. A more recent project was an art installation that was completed in partnership with Clean & Beautiful City and the City of Toronto. The newly reconstructed Oakwood Village Transit Island, located directly at the corner of Oakwood and Vaughan, was completed in October 2010. Standing tall in this oasis is a 4.88 metres (16.0 ft) steel palm tree that represents the strong roots put down by the residents of Oakwood Village. The palm tree, which can be found throughout the world's warmer nations, is a symbol of unity—the coming together of the many diverse groups in the Oakwood–Vaughan community. However, the tree generated local controversy, as a political hopeful stated that it cost the city $350,000 to erect. The actual cost of the tree was $4200. The Oakwood Village Arts Festival, held annually in June, is brings the community together around arts by providing a public platform for local artists and musicians. As a curated festival revolving around the theme of village, this event features theatre, dance, music, creative writing, art exhibits, interdisciplinary works and public discussions. The area is also home to the Arlington Village Project, along the western border with Humewood-Cedarvale, which works to create more positive community building and connecting events in the area. Starting in 2010, the project has organized outdoor fairs. Built in 1936, former Mount Zion Apostolic Church of Canada is one of the hundreds of apostolic churches in Toronto. It was relocated to North York. According to the 2006 Census of Canada, the top 6 languages spoken at home are English, Italian, Portuguese, Spanish, Chinese, and Tagalog (Filipino). Among ethnic origins, Italian is the highest, followed by Portuguese, English, Filipino, and Canadian. There are also a significant number of Caribbean shops and restaurants in the area. Oakwood–Vaughan is home for many artists and their families, and has officially been designated as an arts district. It is also an area which houses two community-based facilities: Art Starts and The Oakwood Village Library and Arts Centre. Statistics Canada data indicates that 8% of the area’s residents are employed in art or recreation compared with the 5% average for the City of Toronto. The non-Canadian citizen population in 2006 was 920 people, and the Canadian citizen population in 2006 was 5400 people. In 2011, the non-Canadian citizen population was 975 people, and the Canadian citizen population was 5350 people. This data on non-Canadian and Canadian citizen population is only for the census tract 5350164.00. The data represents the population of Oakwood Village living on Oakwood Avenue, between Glenhurst Avenue and Earlsdale Avenue. The data is collected from the 2006 long form census and the 2011 National Household Survey. The public school districts serving the community are Toronto District School Board (secular anglophone), Toronto Catholic District School Board (Catholic anglophone), Conseil scolaire Viamonde (secular francophone), and Conseil scolaire de district catholique Centre-Sud (Catholic francophone). Oakwood Collegiate Institute, at the southwest corner of Oakwood Avenue and St. Clair Avenue. The school is technically located in the Regal Heights neighbourhood enclave of Corso Italia/Davenport, south of Oakwood–Vaughan, but serves students from both neighbourhoods. Vaughan Road Academy, at Vaughan Road between Alameda Avenue and Winona Drive, closed in 2017. It offered the IB Diploma Programme when it was open. The Maria A. Shchuka Library is one of two branches of the Toronto Public Library located in Oakwood–Vaughan. St. Thomas Aquinas, D'Arcy McGee, and St. Alphonsus. Rawlinson Community School, on Glenholme Avenue. J.R. Wilcox Community School, on Ava Road between Winona Drive and Atlas Avenue. Fairbank Public School, at the intersection of Eglinton Avenue West and Dufferin Street. Built in 1997, Oakwood Village Public Library is located on Oakwood Avenue and Holland Park Avenue. In addition to Oakwood Village branch, the Maria A. Shchuka Public Library, which was re-rebuilt in 2003, is also located on the neighbourhood's periphery at Eglinton Avenue and Northcliffe Boulevard. Both of these libraries are run by the Toronto Public Library. The neighbourhood is west of the Eglinton West station, and has three 24-hour bus routes: the 29 (Dufferin Street), the 32 (Eglinton Avenue West), and the 63 (Oakwood Ave) which runs between Eglinton Ave West Station and Liberty Village. There are other buses that operate very frequently, including the 161, which runs along the southern stretch of Oakwood Avenue and along Rogers Road, and the 90, which runs along Vaughan Road to St. Clair West station. The 512 (St. Clair Ave West) streetcar route that runs east-west along St. Clair, just below the southern border of Oakwood–Vaughan. The bus routes and the 512 streetcar route are operated by the TTC. The Rogers Road streetcar line formerly ran along Rogers Road before being replaced by a trolley bus route, in turn later replaced by the route 161 Rogers Road bus. ^ "Oakwood Village". Retrieved 2015-07-02. ^ "The Toronto Amalgamation: Looking Back, Moving Ahead". Retrieved 2009-07-17. ^ "City of Toronto: Ward Profiles". Archived from the original on 2009-06-21. Retrieved 2009-07-17. ^ "Davenport Riding". Retrieved 2009-07-17. ^ "St. Paul's Federal Riding". Retrieved 2009-07-17. ^ "Oakwood Village BIA". Retrieved 2010-12-17. ^ "Oakwood Village Community Association". Retrieved 2011-02-10. ^ Coorsh, Karolyn (2008-10-01). "All night booze cans mar area". Town Crier. Retrieved 2009-03-30. ^ "Art Starts Belvidere Ave. Mosaic Wall, 2007". Retrieved 2009-07-17. ^ "Community supports aluminum palm tree, 2010". Retrieved 2010-12-17. ^ McLean, Jesse (19 October 2010). "The Smell Test: The real cost of a steel palm tree". Toronto Star. Retrieved 19 October 2010. ^ "It Takes a Village". Retrieved 2010-12-17. ^ "Social Profile #2 - Neighbourhoods - Language and Ethnicity" (PDF). Retrieved 2009-03-01. Wikimedia Commons has media related to Oakwood-Vaughan.